Anyone with a passion for sound who's seen Stanley Kubrick's 1971 movie ' A Clockwork Orange', couldn't fail to notice the distinctive turntable used in the film. 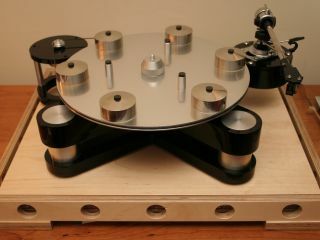 Sharp-eyed audiophiles will recognise it as Transcriptor's iconic Hydraulic Reference turntable which, due to it's special hydraulic nature, allowed its users to fine-tune its speed. Now some 36 years later, Tech.co.uk is delighted to announce the return of the legendary brand. The sons of late designer David Gammon are re-launching Transcriptor with the release of some new models. Tech.co.uk has details of the first deck to arrive, the £1,750 Spider, which had its first outing at London Sound & Vision Show 2007 in Heathrow. Although details of the products are limited, we do know that the company is also planning to re-launch the legendary Hydraulic Reference turntable as seen in the cult film. So if the turntable was out of financial reach in the 1970s, now could be the right time as a projected price of £3,500 has been mooted. Until the launch of the new Spider, the only way to experience the Transcriptor sound is via eBay or the classified pages of Hi-Fi Choice!